Charlie, aka Hesadogthatsgone, is an almost 4-year-old red brindle male, born September 22, 2002, to sire CJ Pepto Geno and dam She's Awoowootoo. Charlie's racing career started May 7, 2004, in Oregon, moving to Valley Race Park in Harlingen, TX, then to Flager and Naples/Ft. 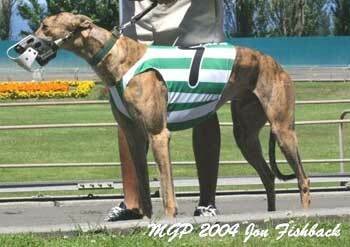 Myers tracks in Florida and ended April 6, 2006, at Valley Race Park in Harlingen when he suffered a career-ending break of his hock. On April 11, Charlie underwent surgery under the care of Dr. Bob Radasch of the Dallas Veterinary Surgical Center. Charlie's injury was a Grade IV central tarsal bone and calcaneous fracture. 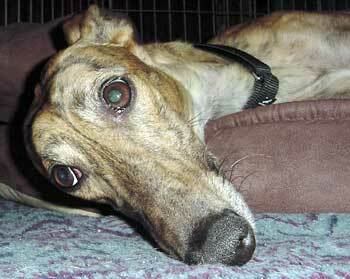 On August 1, 2006, Charlie was released by Dr. Radasch, and is now ready to find his forever home. It is not known at this time if Charlie is small animal or cat tolerant.